Autumn is the most beautiful season of the year and gives the outdoors a whole new sense of enchantment. Naturally, this is the perfect time of the year to bring out the most creative LED lighting solutions that really complement the season’s brilliant soft fall colors. LED’s, among other lighting options, are great for decorative lighting because they come in various types, sizes, and colors. Such lighting is very discreet and does not distract observers from the overall scenery. It’s also known to be more energy efficient than standard lighting. The following are some simple ideas to get your creative juices flowing. If you need a non-intrusive lighting solution in different colors, then LED strip lighting is a superb option. LED strip lights feature an adhesive that allows users to install the lights on virtually any common household surface. Create dazzling color changing effects by combining RGB Strip Lights with a light controller and a remote. This allows you to independently adjust the colors to fit any holiday or birthday theme. For this fall, outline the railing on the porch or under the lip of the steps to brighten up the dark spots at night. Using 80% less energy than halogen lights, LED lighting fixtures are the perfect addition to your deck. 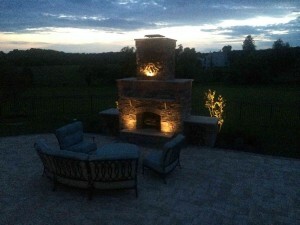 Illuminating your patio space creates a functional and attractive outdoor living space after the sun sets. By using LED light fixtures, you can create a lovely useful space with a fraction of the energy use. With a combination of landscape lights to illuminate the space around your patio and down lighting to put a gentle wash over the whole area, you can enjoy your patio every night of the week. If your patio is primarily used as an outdoor entertaining space, you can even hang some festive lighting to create that special event feeling year-round. Lighting is the number one addition you can make to your home to brighten a gloomy or dreary setting. This entry was posted on Friday, September 1st, 2017	at 5:18 pm	. You can follow any responses to this entry through the RSS 2.0	feed. Both comments and pings are currently closed.